February 8, 2010—In spring 2007, a Lincoln couple downsized from a suburban half-acre ranch to a smaller home and lot in the Near South Neighborhood. Their decision to downsize was based on several factors. Both Bob Pewthers and Carol Smith, avid walkers and bikers, found access to their favorite destinations would be easier if they were more centrally located. Also, the shady suburban lot hindered gardening, unlike the “new” bungalow’s sunny backyard. And, quite simply, the ranch house with four bedrooms was just too large for their needs. At the “new” old house, their first changes were simple steps to reduce energy use. Carol endorses expert advice recommending more insulation, weatherstripping where needed, efficient windows, low-energy lighting and Energy Star appliances. 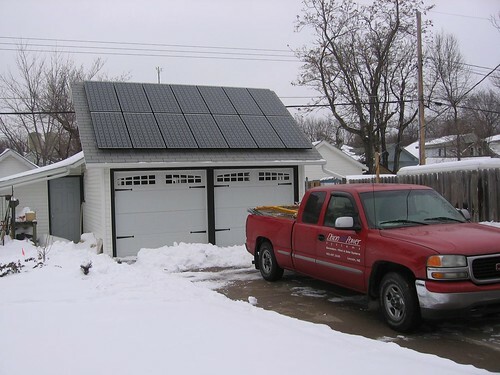 In spring 2008, after gathering information from local contractors and the Nebraska Energy Office, the couple decided to convert from natural gas to electricity by installing a geothermal heat pump for their heating and cooling needs. The plan for the couple’s home called for three 200-foot wells. As with any project, things can go wrong. Their second well failed, forcing them to go with five wells, one 200-foot and four 100-foot. The wells, heat pump and electrical work cost almost $13,000. The pair’s latest and most expensive project, a solar photovoltaic (PV) system, required many hours of self-education and research. PV systems convert sunlight directly to electricity. They work any time the sun is shining, but more electricity is produced when the sunlight is more intense and when rays of sunlight are perpendicular to the PV modules. Carol and Bob’s modules are inclined using an average of summer and winter angles. Batteries (optional) provide energy storage or backup power in case of a power interruption or outage on the grid. The alternative to having battery storage is net metering, recently legislated in Nebraska. When Bob and Carol’s PV system generates more power than they need, the excess goes to LES. Likewise, when their PV system isn’t meeting their energy needs, they draw electricity from LES. With many options such as buy or lease, high end components or low end, grid connected or stand alone, backup power, monitoring, roof mount, ground mount, tracking, wind or solar or combination, customer goals are key. According to Carol and Bob’s installer, Jon Dixon of Dixon Power Systems, there is no cookie cutter solution. “People think a specific product or size will fit a specific home size. Architects are always asking how much do you need per square foot of building size but it’s all about the kilowatt hours that you use and what your goals/wants are, in my opinion,” states Dixon. To figure out Carol and Bob’s energy needs, Dixon reviewed a year of the couple’s electric bills. He designed a system with fourteen 210-watt Sanyo panels producing 2.94 kilowatts under full sunlight. The house was mostly in the shade, so they decided on a garage installation. Unfortunately, their garage had an east/west facing roof. 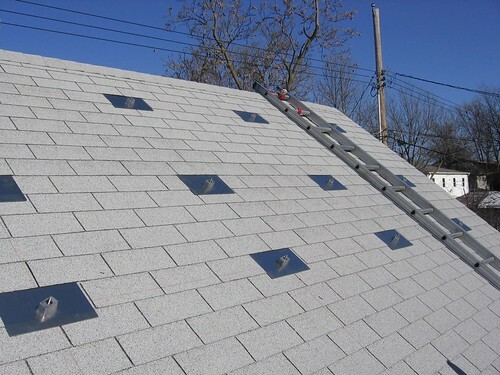 So they had the roof altered to orient the solar panels to the south, an extra cost of $6,000. 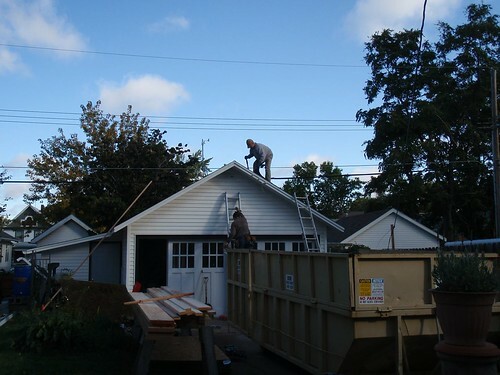 Deconstructing the garage to create a south-facing roof for the PV modules. 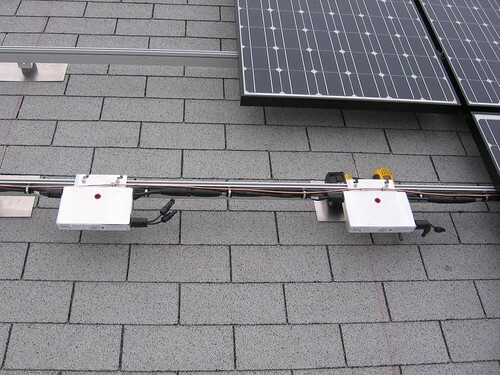 The UniRac Solar Mount racking system being installed. SolaDeck junction box. The wires from the micorinverters are joined here and routed to the breaker box inside the garage. Close-up view of Enphase Microinverters. Photo of the completed system. 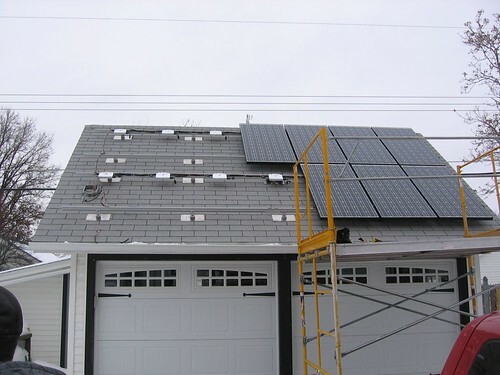 The PV modules, each with its individual inverter, cost $24,000 installed. Additional electrical work including the net metering connection came to a little over $3,000. Now is an opportune time for homeowners interested in solar, wind and geothermal because of federal tax credits and loan programs. According to the U.S. Department of Energy, solar energy systems can receive a tax credit of 30 percent of cost with no upper limit. And the Nebraska Energy Office is currently offering 2.5 percent loans for solar. For more information on these opportunities visit, www.energystar.gov and www.neo.ne.gov. http://infinergywindandsolar.com/storage/pdf/OUR%20HarvestSun%20flyer.pdf The program consists of a 10-year lease and a 5 percent payment at the end of the 10 years. Although PV systems require a high initial investment, there are many benefits: reduction in monthly electrical bill, conservation of fossil-fuel resources, reduction of air pollution, addition of an energy-producing improvement to property, less vulnerability to future electricity price increases and a sense of independence. Bob and Carol’s main motivation is conservation, but they also believe strongly in education. Take advantage of the homework done by them and others. Study their system’s performance in real-time on the Internet. Ask questions.